FREDDIE FOR TAKE-OFF! British Airways and Heathrow baggage handlers perform tributes to one-time Heathrow baggage handler Freddie Mercury for the Queen legend's September 5th birthday celebrations at Heathrow T5. 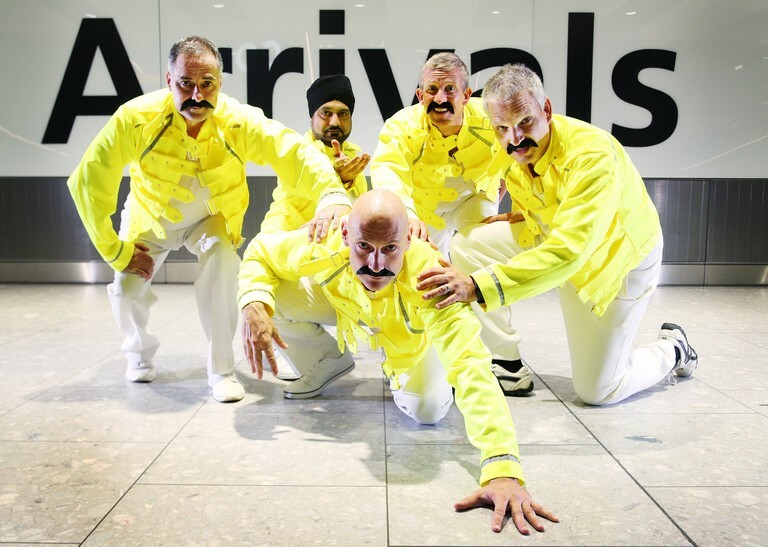 The baggage handlers have been taking professional choreography lessons learning a full routine to 'I Want To Break Free' as part of a special celebration ahead of the release of BOHEMIAN RHAPSODY, the new Queen movie released on October 24th. The late musician Freddie Mercury, lead singer of the ground-breaking and iconic band Queen, would be celebrating his 72 birthday on Wednesday, September 5, this year. Freddie Mercury died in 1991 at age 45 due to complications from AIDS. Fans around the world honour Freddie Mercury every year on September 5 (Freddie’s birthday) with a global charity celebration called “Freddie for a Day”. Many celebrate his life by donning a white vest, his famous yellow jacket and sporting a trademark moustache to dress up like the late singer. The event, celebrated across the globe, raises money for the Mercury Phoenix Trust, the AIDs charity set up in his name in 1992. He adopted the name Freddie while at St. Peter’s, the English boarding school he attended in India, before he and his family moved to England. Freddie co-owned and ran a stall in Kensington Market in London with Roger Taylor, which opened in the summer of 1969. They sold Freddie’s own artwork as well as second hand clothes. The two of them kept up the running of the stall, even after Queen released their first album in 1973. Freddie had four extra teeth on his upper jaw, which were pushing on the front ones. He never considered “fixing” them because he believed that they contributed to the special sound of his voice – the legendary four-octave range. One of the most technically accomplished singers to work in pop music, in a list of the greatest English language singers of the 20th century, compiled by BBC Radio, Freddie was ranked No.10. The list included Frank Sinatra, Billie Holliday, Barbra Streisand, Ella Fitzgerald and Nat King Cole. In 2016, a research team undertook a study to understand the unique appeal of Freddie’s voice. The Austrian, Czech and Swedish researchers studied archival recordings. They noted the singer’s faster vibrato and use of subharmonics, particularly in comparison to opera singers. Other than his passion for music, one of Freddie’s favorite hobbies was shopping, mainly for other people. Generous to a fault, he loved buying expensive perfumes, cologne, watches and jewellery. Despite not believing in astrology, Freddie designed Queen’s crest using the astrological signs of the four members: two Leos, one Cancer and one Virgo.